Cutting the Cord and Cutting the Bills: Got 3-D? (part 4): BluRay 3-D! Got 3-D? (part 4): BluRay 3-D! You know the old saying "You learn more from failure than you do from success"? Well, it couldn't be more true in my case as I almost have BluRay 3-D movie playback working. This is part four of a series of posts on 3-D for my Media PC. You can start at part one here. If you are into gaming, and/or are planning on getting a discrete graphics card don't buy a low-profile case (go full height). 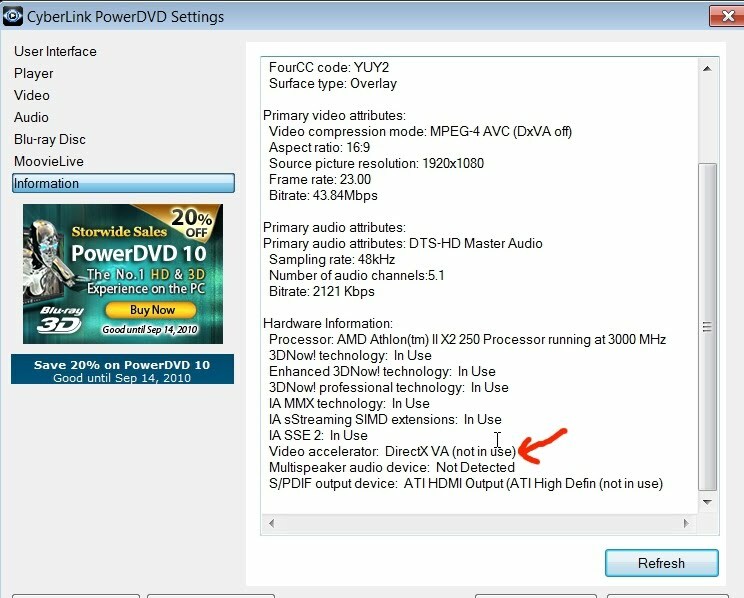 It is very difficult to find a low profile graphics card that (currently) can decode BluRay 3-D, is silent, and/or is low cost. BluRay 3-D is still really new. There are only a few movies that you can buy and graphics driver support is still evolving. You can throw money at the problem and buy a solution that works today, but my advice is to wait a bit until the dust settles. As soon as there are a lot of titles available there will be more widespread hardware support (so you'll have more options). I'm using a low cost integrated graphics adapter (ATI's Radeon HD 4200) and it could be expecting a bit much from this solution to have it be able to do BluRay 3-D. Nevertheless, it seems to be able to handle other 3-D video formats (even up to 1080p), so it isn't out of the question that it could do it with some time and better drivers. I'll share the things that I tried and how close I got. 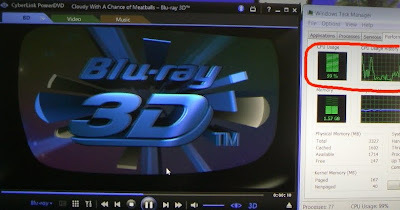 In order to play BluRay 3-D you need some up to date player software. PowerDVD 8 which came with my retail BluRay drive only plays back regular 2-D BluRay movies. Note that PDVD8 will load a 3-D disk, it just won't let you select the 3-D version (you can still play it in old-fashioned 2-D). 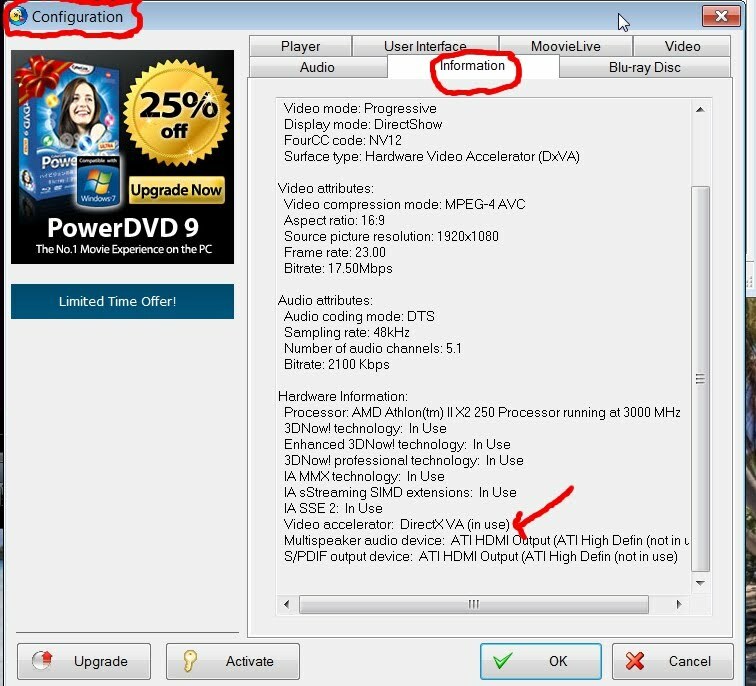 One upgrade choice is PowerDVD 10 Ultra. Fortunately, you can download a demo version that works for 30 days. Plenty of time to try it out to see if it works on your hardware. This is the version that I used. TMT3 also has a demo version which you can download. However, I've found that the demo version doesn't support BluRay 3-D. You need to install a paid 3-D plugin. Now the plugin only costs $20, but I find it rather annoying that you can't try out all the features before committing to buy (especially if you are not sure your hardware will work). So, I didn't try it out. Besides, I suspect that it would have the same result as PowerDVD 10 on my system (as I'll discuss below). 2. You need a 3-D movie, obviously! 3-D BluRay movies are different than regular 2-D (obviously). Only a few of these are available now, but I suspect that they will get increasingly popular since the new 3-D is so much better than the old Anaglyph 3-D that we are used to. I read a lot of good reviews about the movie "Cloudy with a chance of meatballs" and people generally liked the 3-D effects (much better than in "Monsters v.s. Aliens". It also helped that I hadn't seen the movie yet. Note that I expected multiple disks in the package since it advertised both 2-D and 3-D versions. There is only one disk, and you are prompted when starting playback which version you want to play. Nice! No more hassles with multiple disks! 3. What else do you need? I've already gone over what you need for 3-D in my previous articles. You need 3-D glasses, a 3-D Ready TV and a 3-D source (in my case a Media PC). 4. So, did it work? Almost... I can get the movie to play in 3-D, however there are some obvious problems on my system. The first is that the player drops frames causing the picture to appear a bit jumpy. The panning scenes have stutter (a clear indication that there is a problem). However the most serious problem is that the sound lags way being the video (and tends to break up a bit). Both problems make the movie basically unwatchable in 3-D. The good news is that the 3-D effect is undiminished by these problems. You can put on your 3-D glasses and see depth in all of the scenes. Not that you'd actually want to watch the movie this way, but it is nice to see what you are missing to know if it is worth the effort to fix it. 5. Okay, why doesn't it work? While the problems are clear indications that the system doesn't have the horsepower to decode the 3-D BluRay movie, we should probably do some investigation before trying to solve the problem. Here is the first clue. When playing a regular BluRay movie, the system hardly breaks a sweat. Here I'm playing the 2-D version and have a performance graph running at the same time. I've highlighted the cpu usage (it ranges from about 15% to 25% while playing the movie). This is hardly what I consider "stressed" and the system clearly has plenty of headroom when decoding regular BluRay. This helps offload the CPU and makes BluRay playback possible on modestly powered systems. Note that I don't really consider a dual-core 3Ghz cpu "modest", but it is no performance screamer either. More on that later. Ah ha! DirectX VA is not in use! If the cpu doesn't have any/much help from the GPU, it is no wonder the cpu is running flat out and can't keep up. Nevertheless, it is interesting to note that it still almost works. So, why isn't DirectX VA available? I think this is the fault of the ATI graphics drivers (not the player software). From what I could discover, ATI doesn't yet have hardware support for decoding BluRay 3-D. Here is a relevant thread. It looks like ATI has committed support for it's 5000 series cards soon. Who knows if the HD 4200 would be supported as well? Nevertheless, I've read that some people have had success with some of their higher end ATI 5000 cards. It isn't immediately clear to me how this is working for them (without acceleration support) unless it is due to the fact that they have a faster cpu. 6. What about getting a faster cpu? Since my system is on the verge of having enough cpu to play a BluRay 3-D, I wondered what would happen if I got a faster cpu? I have a fairly inexpensive 3.0 Ghz dual core cpu after all. Rather than buying another cpu, I thought I'd give overclocking a try. The motherboard that I bought has a bunch of features that make overclocking relatively easy. Nevertheless, I realized I had a lot to learn as to what is and isn't possible with a budget system. Note: I don't think overclocking is a solution. With overclocking you can run into stability problems and you tend to give up power efficiency features (AMD's cool n' quiet). Even so, it is an interesting experiment. Let's break out a case of Red Bull and see what this baby can do! Before you get started overclocking, it is good to have a simple benchmark so you can tell if there are any improvements. I chose HyperPi. It is trivial to run and is a good test of core cpu speed (and should also be applicable for software video decoding). Baseline performance: I could calculate 2 million digits of Pi in about 65 seconds. By following the guidelines here, here and a few other places as well, I was able to crank up the cpu clock to about 3.4 Ghz before my system became unstable. I won't bore you with the details of "front-side bus" speeds and what-not, just suffice it to say that it was quite the learning experience. Don't try this at home unless you don't mind smoking your system! So, what could it do now? With the turbo charged settings I could do the same calculation in about 54 seconds: 11 seconds faster (or about 17%). Not too bad. I'm sure I could have done much better with a good cpu cooler and cpu/memory chosen specifically for overclocking (which I don't have). Okay, now on to playing a video in 3-D! Did it help? Short answer: Yes, but not quite enough. I saw noticeably fewer dropped frames and the sounds stayed in sync longer. However, the cpu was still maxed out and the main problem remained. I suspect with a fairly high end cpu and better memory, I probably could have succeeded. 7. What else can I try? It also occurred to me that some of the cpu load during playback might be due to decrypting the BluRay Disc itself. So I tried ripping the BluRay with DVDFab (to an ISO image). Unfortunately, this didn't help. The rip would play 2-D, but not in 3-D. I suspect that this is a bug in DVDFab that will probably be fixed soon. I also tried ANYDVD and at least the rip worked. However, playing the ripped movie in 3-D had the same problems. Oh well, it was worth a try. However, I did enjoy the fact that I could now skip all of those annoying warning messages at the beginning of the disc. It made it much quicker to test possible fixes! 8. Okay, I give in! How about a Nvidia graphics card! Nvidia seems to be a bit ahead of ATI when it comes to 3-D support, so it makes sense to try an Nvidia card next. I was all set to run down to Fry's to try this out when I realized that I had a problem. I have this nice low profile case that is a perfect form factor for a Media PC. However, it also means that any cards that you put into it must also be low profile. This isn't a major problem for common cards that you might put into your PC (like my dual ATSC tuner and Wireless-N cards). However, for graphics cards this severely restricts your choices. So, I'm probably stuck for now. However, if you have a full height case, I've read good things about Nvidia's GT 240 card. You can even get a passively cooled version that would be perfect for a quiet Media PC. This one by Zotac seems to be pretty popular and has good reviews. There are a couple of links here and here indicate that people have had success with the GT 240 playing BluRay 3-D (and games). It is also in the list of cards Nvidia says support 3-D (all good). Sadly, it looks like a full height card (and even double width). There is no way this would fit into my case. However, if your case is big enough (i.e. normal PC sized) and you want a budget discrete graphics card that does BluRay 3-D, this might be the ticket. Another advantage to a discrete graphics card for high end Media enthusiasts is that they can support high definition audio as well. My HD 4200 can only do up to Digital Dolby and DTS. As they say, we learn way more from failure than we do success. The gotcha is that it might not be anything useful (chuckle). This was a fun exercise even if I can't watch my movie in 3-D (yet). However, let's put this in perspective. BluRay 3-D is really new and there are so few movies available that it is really nothing to lose any sleep over. While you can easily throw money at the problem, half the fun is to see how cheaply you can find a solution. I think in the next 6 months 3-D will become much more common and driver support will materialize. 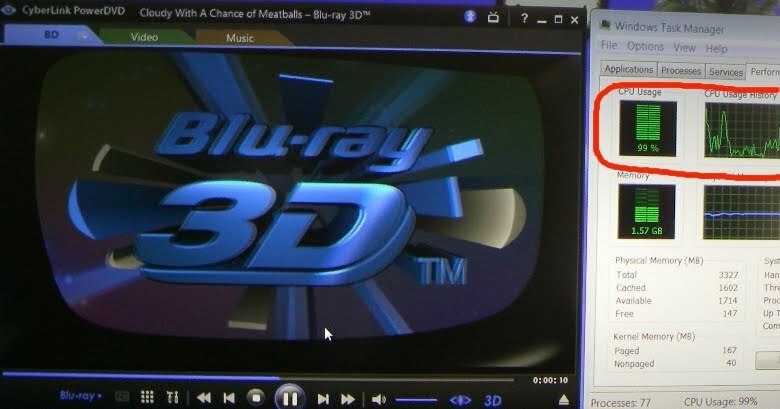 Who knows, maybe ATI will even see fit to add BluRay 3-D hardware support for the HD 4200! It is possible and the system clearly (to me) has the capability to do it. If not, then you can always upgrade your hardware. However, I'd wait until there are lots of compelling movies (and great examples of 3-D) that really make it worth you while. In the meantime, I'd just enjoy some of the other uses of 3-D that we can do on our systems (as is)! Don't fret - as you mention, it's only a matter of time until the hardware manufacturers catch up with a reasonably priced low profile card for 3D. Beside, Christmas is right around the corner - who knows what Santa may bring! Personally, I am waiting for the next generation of 3D projectors/TV's where you don't need to wear the silly glasses! This would be perfect for your slim case! Thanks for the tip, nice find! BTW: I've been told by Garry Whittaker (Digital LifeStyle) that his ga-ma79gm-s2h (ATI HD 3200) with an AMD Phenom x3 cpu can play BluRay 3D and output checkerboard using TMT3. Since my system has newer graphics (HD 4200), but an effetively slower cpu there is clearly a working solution using ebedded graphics! I'm not sure if it is the TMT3 software or what, but I'll try a few more combinations to get BD3D working on my setup. I'll report on that soon. Nevertheless, a discrete graphics card is clearly the way to go for gaming anyway.